At Schreppler Chiropractic Offices P.A, we welcome the opportunity to help you improve your health. Rose, Claire and Maureen at the front desk are ready to welcome you and answer any questions you have. We’ll ask you to arrive early, so you have time to complete some paperwork. There is rarely a wait before you see Dr. George. He will complete an examination and determine whether X-rays are needed. In most cases, they aren’t necessary. You’ll receive your first adjustment during your initial appointment. 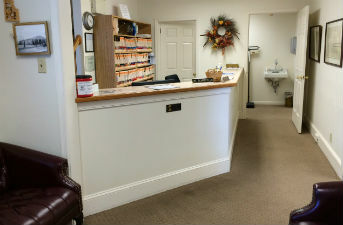 At your second visit, we will ask you how much relief you’ve had or whether there’s been a change in the symptom pattern that occurred following the first treatment. Based on that, Dr. George will decide what you need in terms of any future care. “I never project more than 2-4 weeks. There’s no scientific evidence that backs going beyond 30 days of treatment,” says. Dr. George. You’ll receive therapy from our G5 vibration unit or the intersegmental traction table when you arrive for your appointment. We find that your adjustment will be more effective by relaxing you with these therapies. Then, you’ll see Dr. George. He’ll start with motion palpation on your spine, do any myofascial release work necessary for your muscles or connective tissue and then adjust your spine or extremities as needed. Living in today’s day and age means constant stress. Let our therapeutic options give you lasting results. Contact us today!